Reverse osmosis (RO) is a water purification technology that uses a semipermeable membrane to remove larger particles from drinking water. In reverse osmosis, an applied pressure is used to overcome osmotic pressure, a colligative property, that is driven by chemical potential, a thermodynamic parameter. Reverse osmosis can remove many types of molecules and ions from solutions, including bacteria, and is used in both industrial processes and the production of potable water. The result is that the solute is retained on the pressurized side of the membrane and the pure solvent is allowed to pass to the other side. To be “selective”, this membrane should not allow large molecules or ions through the pores (holes), but should allow smaller components of the solution (such as the solvent) to pass freely. In the normal osmosis process, the solvent naturally moves from an area of low solute concentration (high water potential), through a membrane, to an area of high solute concentration (low water potential). The movement of a pure solvent is driven to reduce the free energy of the system by equalizing solute concentrations on each side of a membrane, generating osmotic pressure. Applying an external pressure to reverse the natural flow of pure solvent, thus, is reverse osmosis. The process is similar to other membrane technology applications. However, key differences are found between reverse osmosis and filtration. The predominant removal mechanism in membrane filtration is straining, or size exclusion, so the process can theoretically achieve perfect exclusion of particles regardless of operational parameters such as influent pressure and concentration. Moreover, reverse osmosis involves a diffusive mechanism, so that separation efficiency is dependent on solute concentration, pressure, and water flux rate. Reverse osmosis is most commonly known for its use in drinking water purification from seawater, removing the salt and other effluent materials from the water molecules. Osmosis is a natural process. When two liquids with different concentrations of a solute are separated by a semipermeable membrane, the fluid has a tendency to move from low to high solute concentrations for chemical potential equilibrium. Formally, reverse osmosis is the process of forcing a solvent from a region of high solute concentration through a semipermeable membrane to a region of low solute concentration by applying a pressure in excess of the osmotic pressure. The largest and most important application of reverse osmosis is the separation of pure water from seawater and brackish waters; seawater or brackish water is pressurized against one surface of the membrane, causing transport of salt-depleted water across the membrane and emergence of potable drinking water from the low-pressure side. The membranes used for reverse osmosis have a dense layer in the polymer matrix—either the skin of an asymmetric membrane or an interfacially polymerized layer within a thin-film-composite membrane—where the separation occurs. In most cases, the membrane is designed to allow only water to pass through this dense layer, while preventing the passage of solutes (such as salt ions). This process requires that a high pressure be exerted on the high concentration side of the membrane, usually 2–17 bar (30–250 psi) for fresh and brackish water, and 40–82 bar (600–1200 psi) for seawater, which has around 27 bar (390 psi) natural osmotic pressure that must be overcome. 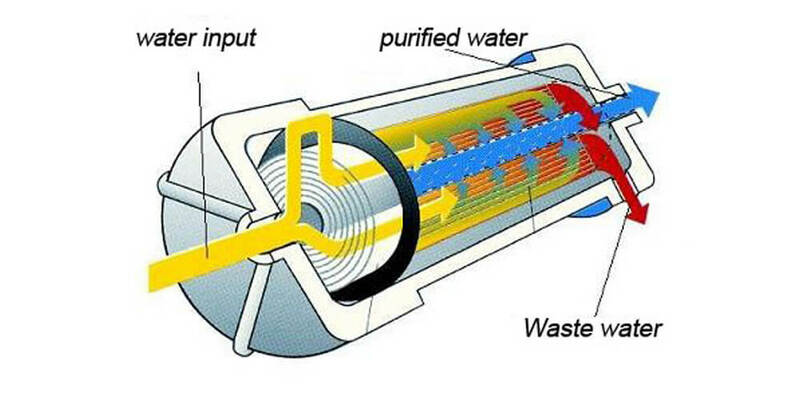 This process is best known for its use in desalination (removing the salt and other minerals from sea water to get fresh water), but since the early 1970s, it has also been used to purify fresh water for medical, industrial, and domestic applications. Rain water collected from storm drains is purified with reverse osmosis water processors and used for landscape irrigation and industrial cooling in Los Angeles and other cities, as a solution to the problem of water shortages. In industry, reverse osmosis removes minerals from boiler water at power plants. The water is distilled multiple times. It must be as pure as possible so it does not leave deposits on the machinery or cause corrosion. The deposits inside or outside the boiler tubes may result in underperformance of the boiler, bringing down its efficiency and resulting in poor steam production, hence poor power production at the turbine. It is also used to clean effluent and brackish groundwater. The effluent in larger volumes (more than 500 m3/d) should be treated in an effluent treatment plant first, and then the clear effluent is subjected to reverse osmosis system. Treatment cost is reduced significantly and membrane life of the reverse osmosis system is increased. The process of reverse osmosis can be used for the production of deionized water. Reverse osmosis process for water purification does not require thermal energy. Flow-through reverse osmosis systems can be regulated by high-pressure pumps. The recovery of purified water depends upon various factors, including membrane sizes, membrane pore size, temperature, operating pressure, and membrane surface area. In 2002, Singapore announced that a process named NEWater would be a significant part of its future water plans. It involves using reverse osmosis to treat domestic wastewater before discharging the NEWater back into the reservoirs. An increasingly popular method of cleaning windows is the so-called “water fed pole” system. Instead of washing the windows with detergent in the conventional way, they are scrubbed with highly purified water, typically containing less than 10 ppm dissolved solids, using a brush on the end of a long pole which is wielded from ground level. Reverse osmosis is commonly used to purify the water.